Good afternoon and happy Friday. I'm very happy to be sharing my 'Nobody's Here' piece for Lost Coast Designs. 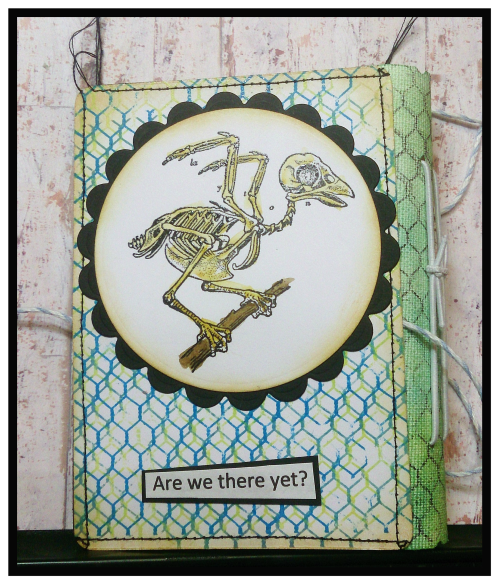 Yup it's another page in my mini book (this is the back cover) and I've used one of my favourite birds Bird Bones, and the fabulous and ever so useful Large Chickenwire Background. As always if you click here you will be whisked over to the Portal, and I'll show you how this came together. What a great stamp that is Sue, all topped off by those quirky words hee hee!! Makes for a great Journal cover. Hope you've had a super weekend..
P.S Sorry i'm late to visit, really struggling with this laptop and every page takes forever to load in.. *Are we there yet* seems very fitting .. I'm walking backwards again!! A fab back cover- gorgeous!